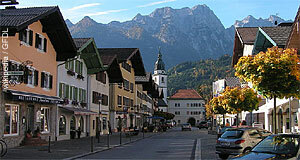 Kuchl is a community in the Tennengau region of Salzburg. Kuchl has a population of approximately 6,600 and is situated at the Hoher Göll, one of the region′s most prominent mountain ranges. The Salzach river runs through Kuchl. In 997, Kuchl became a parish and gradually gained influence until it became the capital of a county that existed until the 15th century. The community is known mainly for two things: As a centre of pilgrimage aimed at St. Severin; and for the Schusterjahrtag. This is a traditional procession of the guilds that attend mass in their guild′s traditional clothing with blazes and flags, then walk via the market square to the "Goldene Stiege" guild house and there they hold an annual general meeting where advanced apprentices "graduate" and new ones get admitted. If you happen to end up in Kuchl far from the Schusterjahrtag day, you can still learn more about the traditions of the Kuchl guilds in the local town museum. A second focus of the town museum lies on Roman finds from Kuchl and its surroundings. If Roman attractions appeal to you, note also the town′s Römerbrücke (Roman bridge). Other sights include the parish church, a smaller church called St. Georg am Georgenberg, and the generally pretty town centre of Kuchl. For outdoors activities and hiking, there are innumerable opportunities: The Hoher Göll will provide paths and routes for more advanced mountaineers; easier routes can be found in the immediate surroundings of Kuchl. Note the Kaiserlinde tree or the Freimoos swamp area. A particularly nice attraction are the Gollinger Wasserfälle, waterfalls that are the border between Kuchl and neighbouring Golling. You will have to approach them from Golling if you want to get really close to the waterfalls. Kuchl is not a place where international visitors typically stay - however, it can be a nice day-trip for those who live in Salzburg for a longer period of time or a stop-over destination if you are on a hiking vacation.